Home Adaptations Are Possums Nocturnal? Is a Possum Nocturnal? MOST possums are strictly nocturnal in that they become most active at night. The peak timing of possums’ activity is from dusk to dawn. As the night falls, the animal climbs into the trees to feed as well as to interact with its counterparts. A few species however do emerge during daylight hours but most do not possibly to avoid potential predators. They will spend much of the day resting in burrows and dens. Sometimes they do prefer to sleep in trees. Are Possums Nocturnal? 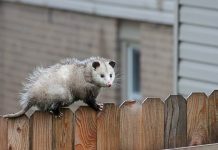 – Is a Possum Nocturnal? The nocturnal behavior of a possum may or may not be natural. That is to say that sometimes animals shift their feeding behavior from night to day or from day to night only to get rid of their predators. Since most birds of prey are diurnal opossums might have probably adapted to living nocturnal lifestyle to get away with raptors. Nonetheless, owls are almost entirely nocturnal so possums still have some serious predators at night too. Although they generally fancy living an arboreal lifestyle they do get to the ground to have some change. Possums are known to travel few meters on the ground. However, they will be pretty keen to climb up to the trees yet again. Common ringtail possums are most active during the first half of the night. Ringtail possums become inactive minutes before dawn. They will relax in a tree hollow all day long. Possums are thought to use clusters of epiphytic ferns as a roosting site.